Cop Tony's (Franco Steeves) life seems to be falling apart of late after he's suspended from duty on police brutality accusations (it was self defense, but a video uploaded onto the internet suggests otherwise), his daughter Carla (Yocelyn Grin) hates him because he has prevented her from running away from California with her boyfriend (Matthew Garry) ... and then his Indian wife Sheila (Elizabeth Abraham) brings back her two small nephews (Armaan Bajpai, Aditya Krukeja) from her latest trip to India, who behave very weirdly and for most of the time pretend to not speak English ... and then Tony and Sheila learn the boys' father has been killed back in India. 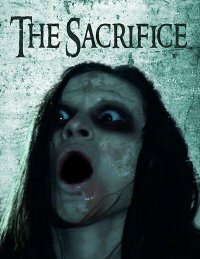 The Sacrifice is an enjoyably effective horror thriller with plenty of elements of action cinema thrown in just for good measure, all carried by a very engaging storyline that twists and turns enough to keep you guessing throughout, to then culminate in an explosive finale. And that the whole thing's decently paced with all the suspense and shocks in all the right places doesn't hurt one bit either, nor does a very decent cast.